Evernote has recently gone through some changes to streamline the service and make it easier to use. All of the versions – PC, Mac, and Mobile – have seen these changes. It’s still the same great app/service, with all of your notes being saved and synced between devices. With these changes, you will see a completely new interface that offers a quick glance at everything – including your notes, notebooks, and tags. It make it much easier to find everything. Another big change is replacing the Favorites bar with Shortcuts. Instead of setting your favorites, you can just drag your notes, tags, saved searches, etc., into the Shortcuts area. Because of all of these great changes, the keyboard shortcuts that are used for the desktop versions of Evernote have been deleted, added to, and changed. Follow the Evernote Cheat Sheet below to find your way around Evernote on the PC and Mac. Ctrl + Alt + N Switch to Evernote and open a new note. Ctrl + Shift + N Create a new notebook. Ctrl + N Create a new note. Ctrl + Shift + T Create a new tag. Ctrl + Alt + T Assign a new tag. Ctrl + Shift + P Print preview. Ctrl + F Open a “Find” box on the open note. Ctrl + Shift + G Find Previous. Ctrl + H Replace within note. Ctrl + Shift + S Create a new search that can be saved. Cmd + N Create a new note. Cmd + Shift + N Create a new synchronized notebook. Cmd + Ctrl + T Create a new tag. Cmd + F Open a “Find” box on the open note. Cmd + Shift + G Find Previous. Can’t get enough of these? You can now download the PDF version of this cheatsheet (newsletter subscription required). 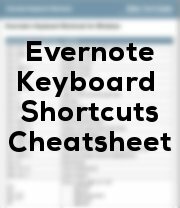 Download Evernote Keyboard shortcut cheatsheet here. Evernote is the kind of app/service that has so many applications that it’s impossible for one individual to tap into all of them, yet it also means that it can be completely adaptable to any one person. These keyboard shortcuts should make it much easier to get around on the improved interface of Evernote to make it even more adaptable and easy to use. The Evernote link is for the Linux sheet. Please make corrections. @Sam. My apology. The link was fixed. You can download it now. Their current android app is horrible. It makes it virtually impossible to do any editing on a phone. I had to freeze it until they update it. How Much Does Screen Size Matter on a Phone?